Every family has their go-to comfort food or traditional meal. Growing up, roasted chicken dinner was it. To this day, the sight and smell of a whole chicken roasting away in the oven brings back fond memories. Like most Sunday night dinners, you make more than you can eat – and that’s where repurposing the leftovers comes in. 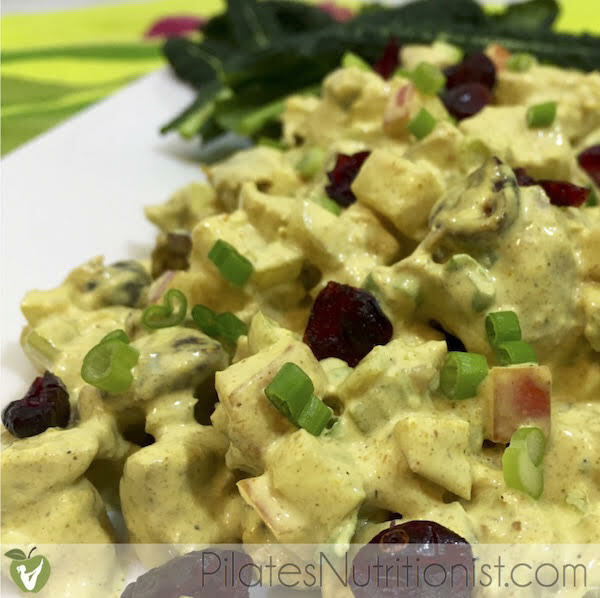 Today I’m sharing a recipe for curried chicken salad with cranberries that makes perfect use of the leftover meat from a roast chicken (pssst – it works equally well with turkey!). I prefer to roast my own chicken, so I get to choose the quality of the meat (pasture-raised is my preference) and the spices, however if you’re in a bind, a grocery store rotisserie chicken works just as well. Most curried chicken salad recipes call for raisins, but I’ve just never been a fan. Usually, people put in wayyyy too much and I find myself picking out about half of them. Curried chicken salad is meant to be savory, not a dessert, right? Dried cranberries – and in a more moderate amount – are a great compromise. You get that touch of sweetness balanced out with a little tartness. Also, “Curried Chicken Salad with Cranberries” just sounds better. That has to be worth something! Let sit for 30 minutes (or overnight) for flavors to meld. Serve in lettuce or kale leaves, with celery sticks, or crackers of choice. NOTE: This recipe works equally well with turkey. Curried turkey salad with cranberries has a good ring to it, no? Avoid processed vegetable oils & icky additives. a) This recipe has a pretty decent amount of curry powder (I’ve even made it with an extra Tbsp of curry powder when I’m really feelin’ it). 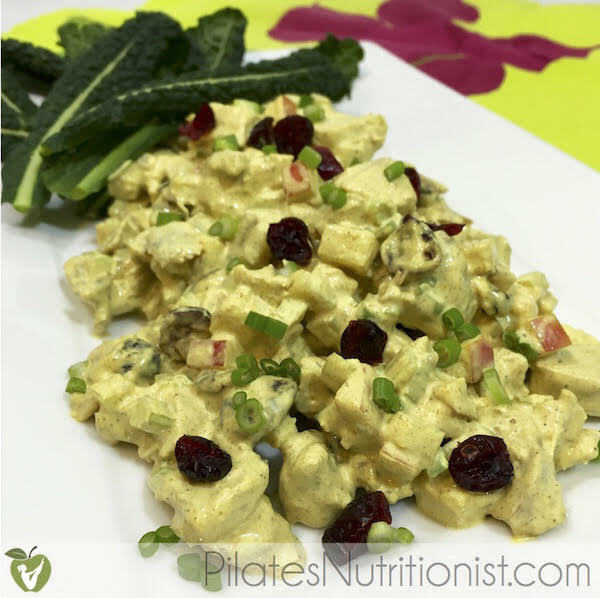 If you like this recipe for curried chicken salad with cranberries, tell me about it in the comments below. PS – If you’re using the meat from a whole chicken, be sure to save all the bones and scraps to make homemade broth from scratch (yep, we’re talking miraculous “bone broth” you’ve heard so much about). Here’s my method. I love curried chicken! I’m usually one who likes hot curries though, but this looks awesome! OMG this looks delicious. I love curried chicken salad, but I’m not a raisin person. I don’t know why I never thought of using dried cranberries. I’m gonna try your recipe stat!